Terence “Bud” Crawford, Amir “King” Khan and Top Rank chairman Bob Arum will host a conference call on March 26 at 1 p.m. ET/10 a.m. PT (5 p.m. GMT) for the year’s most anticipated welterweight showdown. 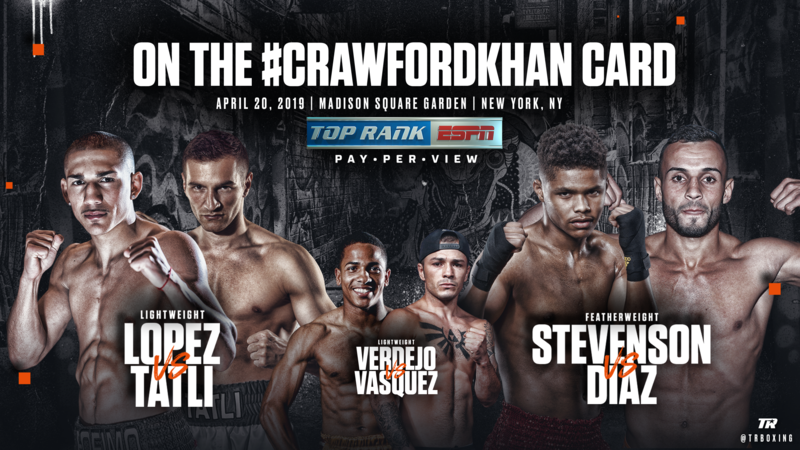 Crawford, a three-division world champion, is preparing to make the second defense of his WBO welterweight world title against Khan on Saturday, April 20 at Madison Square Garden. The Khan portion of the call will begin at 1 p.m. ET, with Crawford to follow at 1:30 p.m.
Tickets priced at $606, $406, $306, $206, $106, $81, and $56 (including facility fees) are on sale now and can be purchased at the Madison Square Garden Box Office, all Ticketmaster outlets, Ticketmaster charge by phone (866-858-0008) and online at www.ticketmaster.com and www.msg.com.